Keywords: plasma-ion coating deposition, pulsed bias potential, intrinsic stress, non-local thermoelastic peak of ion, deposition rate. Influence of atomic sputtering on intrinsic stress and growth rate of the coating made by method of plasma - ion deposition with use of pulsed bias potential and at different incidence angles of ions is theoretically investigated. The formula for intrinsic stress calculation in deposited coating obtained in the model of the nonlocal thermoelastic peak of the ion, taking into account atomic sputtering processes, was used to calculate the stresses in TiN and CrN coatings deposited from Ti+ and Cr+ ion beams, respectively. The stress value for the coatings considered correlates with the modulus of elasticity of the coating material. The stress curve maximum decreases and shifts to the region of higher potentials with increasing angle of incidence. This behavior is due to the sputtering of quasi-stable interstitial defects that determine the level of stress in the deposited coating. A formula is proposed for the coating deposition rate, which takes into account the sputtering of the coating atoms at arbitrary bias potential and the angle of incidence of the ions. It is shown that sputtering sharply reduces the coatings deposition rate and makes it impossible to deposit TiN and CrN coatings in the DC mode at potentials on the substrate exceeding 1.7 kV and 0.7 kV, respectively, and with normal ion incidence. Sputtering has the greatest influence on the intrinsic stress and the growth rate of the coating at ion deposition at inclined angles of incidence α = 45°...70° . The results of the calculations are compared with the available experimental data. Bilek M.M, McKenzie D.R., Tarrant R.N., Lim S.H.M., McCulloch D.G. Plasma-based ion implantation utilising a cathodic arc plasma // Surf. Coat. Technol. 2002. - Vol. 156. - P. 136-142. Pelletier J., Anders A. Plasma-based ion implantation and deposition: A review of physics, technology, and applications // IEEE Transactions on Plasma Science. – 2005. - Vol. 33. - P. 1944-1959. Akkaya S.S., Vasyliev V.V., Reshetnyak E.N., Kazmanlı K., Solak N., Strel'nitskij V.E., Urgen M. Structure and properties of TiN coatings produced with PIII&D technique using high efficiency rectilinear filter cathodic arc plasma // Surface & Coatings Technology. – 2013. – Vol.236 – P. 332-340. Belous V., Vasyliev V., Luchaninov A., Marinin V., Reshetnyak E., , Strel’nitskij V., Goltvyanytsya S., Goltvyanytsya V. Cavitation and abrasion resistance of Ti-Al-Y-N coatings prepared by the PIII&D technique from filtered vacuum-arc plasma // Surface & Coatings Technology. – 2013. – Vol. 223. – P. 68-74. Vasyliev V., Goltvyanytsya S., Goltvyanytsya V., Marinin V., Reshetnyak E., Strel’nitskij V., Tolmacheva G. Durability of the multicomponent nitride coatings based on TiN and (Ti,Al)N deposited by PIII&D method. // Problems of Atomic Science and Technology. – 2015. – No.2. – P. 130-138. Jiang F., Zhang T.F., Wu B.H., Yu Y., Wu Y.P., Zhu Sh.F., Jing F.J., Huang N., Leng Y.X. Structure, mechanical and corrosion properties of TiN films deposited on stainless steel substrates with different inclination angles by DCMS and HPPMS // Surface & Coatings Technology. – 2016. - Vol.29, - P. 54-62. Nelson N., Rakowski R.T., Franks J., Woolliams P., Weaver P., Jones B.J. The effect of substrate geometry and surface orientation on the film structure of DLC deposited using PECVD // Surface and Coatings Technology. - 2014. - Vol.254. – P. 73-78. Xiaowei Li, Peiling Ke, Kwang-Ryeol Lee, AiyingWang Molecular dynamics simulation for the influence of incident angles of energetic carbon atoms on the structure and properties of diamond-like carbon films // Thin Solid Films. – 2014. - Vol.552. - P. 136-140. Vasil’ev V.V., Luchaninov A.A., Reshetnyak E.N., Strelnitskij V.E. Effect of substrate position relative to the flow of filtered cathodic-arc plasma on the structure and properties of TiN coatings // Problems of Atomic Science and Technology. – 2017. – No 2. – P.160-167. Kalinichenko A.I., Perepelkin S.S., Strel’nitskij V.E. Influence of incident angle of ion beam on intrinsic stress in deposited coating // Journal of Surface Physics and Engineering. – 2016. - Vol. 1. – No. 12. - P. 338-345. (In Russian). Davis C.A. A simple model for the formation of compressive stress in thin films by ion bombardment // Thin Solid Films. – 1993. - Vol. 226. – No. 2-3. - P. 30-34. Kalinichenko A.I., Perepelkin S.S., Strel’nitskij V.E. Dependence of intrinsic stress and structure of ta-C film on ion energy and substrate temperature in model of the non-local thermoelastic peak // Diamond Relat. Mater. - 2010. – Vol. 19. – P. 996-998. Kalinichenko A.I., Kozionov S.A., Perepelkin S.S., Strel’nitskij V.E. 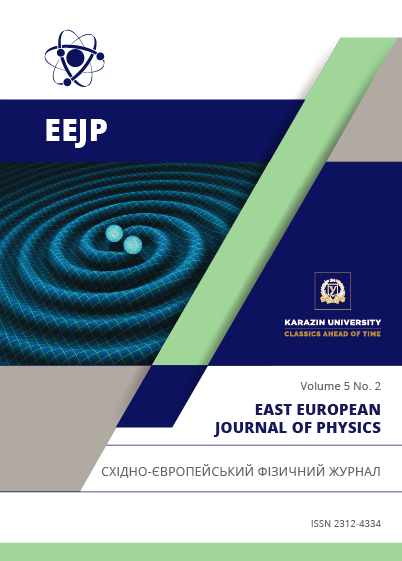 Intrinsic stresses in coatings deposited at plasma immersion ion implantation // East European Journal of Physics. – 2014. - Vol. 1. – No. 4. - P. 58-64. (In Russian). Kalinichenko A.I., Perepelkin S.S., Strel’nitskij V.E. Intrinsic stresses in CrN coatings deposited at different angles of incidence ions // Proceedings of the 2017 IEEE 7th International conference on Nanomaterials: Application & Properties (NAP2017), Zatoka, Ukraine – 2017. - Part 1. - 01PCS104(4p.). Ziegler J.F., Biersack J.P., Littmark U. The Stopping and Range of Ions in Solids. - New York: Pergamon Press, 1996. - 297 p.
Vasyliev V.V., Luchaninov A.A., Reshetnyak E.N., Strel’nitskij V.E., Tolmacheva G.N., Pribytkov G.A., Korzhova V.V. Structure and properties of nitride coatings deposited from filtered vacuum arc plasma generated by evaporation of cromium– aluminum powder cathode // Journal of Surface Physics and Engineering. – 2016. - Vol. 1. - No. 1. - P. 62–80. Vasyliev V.V., Luchaninov A.A., Reshetnyak E.N., Tolmacheva G.N., Strel’nitskij V.E. Vliyanie impulsnogo potentsiala smescheniya na strukturu i tverdost TiN pokrytiy, osazhdennyih iz filtrovannoy vakuumno-dugovoy plazmyi // Sbornik trudov 4 Mezhdunarodnoy nauchnoy konferentsii “Fiziko-himicheskie osnovyi formirovaniya i modifikatsii mikro- i nanostruktur”, Kharkov, Ukraina. – 2010. – Vol. 1. - P. 85 – 89. Bakai A.S., Sleptsov S.N., Zhukov A.I., Marchenko I.G., Sleptsov A.N. Mathematical Modelling of the Densification of Niobium Film Deposited from Self-Ion-Atomic Fluxes // Met. Phys. Adv. Tech.- 1996.- Vol. 15.- P. 1329-1342.